DSQK series multifunctional drill pipe air slip is a power slip used to hold the drill pipe in position in drilling operation, and it is a highly automatic power tool used at wellhead. 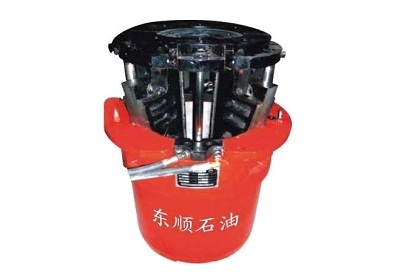 This tool can be used for rotary tables of various drilling rigs, and it can be used to take the place of hand-lifting slip, semiautomatic slip or dual elevator system during tripping operation. The multifunctional drill pipe air slip exhibits such advantages as convenient installation, easy operation, pneumatic movement and automatic mud scraping etc., and it effectively reduces the labor intensity, enhances wellhead safety while dramatically speeds up the tripping operation.The operation procedures herein should be strictly followed, and it should be maintained carefully so as to extend its using life and save cost.